If you’re a petite woman that is 5’5″ or under, or a (middle height gal 5’6″ to 5’7″), you already know that finding fabulous petite clothing is not an easy task. Our issues range from; choosing the right fabric prints, pant hems that are too long, big armholes, to the disproportional scaling of skirts and jackets, thus creating fashion faux pas. There are many times while out clothing shopping that it makes us look like we are kids playing dress up in mum’s clothes! Bella Petite gets that ‘being a petite woman’ often presents us with challenging obstacles on the fashion front lines. Incidentally, it is both frustrating and shocking as to why mainstream clothing designers have yet to tackle petite women’s fashion issues, considering we dominate the marketplace buying power. Quite literally, I found myself in the midst of a fashion crisis! Surely, I couldn’t be the only petite woman experiencing these problems. So I embarked on a solution driven mission advocating for the fashion standards to change and along the way, I discovered that millions of likeminded petite women (both fit, curvy and plus-size) were all experiencing the identical issues. Based on my personal experiences and armed with consumer awareness I sought out to aggravate a paradigm shift towards diversity in the fashion industry; by building marketplace recognition in media with Bella Petite, creating the first and only magazine fashion covers and editorials using petite models. As well as, having produced over 500 fashion shows, model searches and, pageants to ignite the first and only televised events. Undeniably, BellaPetite’s multimedia approach is the first hybrid platform to focus on petite models, petite clothing and petite women’s issues to offer you solutions, while encouraging a paradigm shift in the fashion industry. Today we can see fashion standards have pivoted with more body positive campaigns to global media awareness and now all eyes are on petite women the reckoning is happening! Petite clothing tips. Petite celebrity fashion secrets. Bella Petite Magazine Copyright © CLICK ON THE IMAGE TO ENLARGE. Ann Lauren Bella Petite Editor and Chief proudly present the top twelve winning cover models! 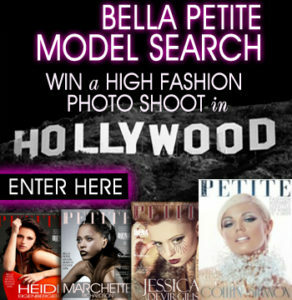 Bella Petite Magazine Copyright © CLICK ON THE IMAGE TO ENLARGE.